A new addition to our research endeavor has been that of green cosmetics. The main challenge is to make cosmetic products that are 100% petroleum free. We have developed a modified cellulose oleogel with very similar properties to those of Vaseline and a moisturizing lotion that has remarkable properties in terms of soothing itchy, dry skin, soothing and repairing sunburned, wind-burned skin or chaffed skin. 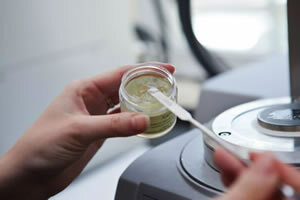 We are currently focusing on increasing the stability of these edible, green and petroleum-free cosmetics. Novel EC-structured medium-chain TAGs that work like a moisture barrier or lip gloss. The clear and stable material is 100% petroleum free.